The response of the atmosphere to the projected decline in Arctic sea ice remains uncertain (e.g., Barnes and Screen, 2015). Earlier studies have predominately focused on the loss of sea ice concentration (fraction of ice within an area) and therefore the total sea ice extent (Fig. 1). As a result of limited satellite observations of sea ice thickness (for more information: Sea Ice Thickness Data Sets: Overview and Comparison), few climate modeling experiments have isolated the role of changing sea ice thickness. Local changes to the atmospheric circulation are affected by turbulent fluxes of sensible and latent heat from the ocean to the atmosphere. Therefore, a greater open ocean from loss of sea ice concentration allows for a larger exchange of these surface heat fluxes. Although to a lesser extent, these turbulent fluxes can also be transmitted through a thinner sea ice cover. It is therefore important to consider both loss of sea ice concentration and sea ice thickness in evaluating the response of the atmosphere. In this study, we conduct sensitivity experiments to isolate the role of sea ice thickness on the atmospheric circulation. We use an atmospheric general circulation model (AGCM) with a well-resolved stratosphere called the Whole Atmosphere Community Climate Model version 4 (WACCM4; with specified chemistry). To isolate the atmospheric response (signal) from internal variability (noise), we run 100 iterations (known as ensembles) for each experiment. We only assess the the fall and winter seasons (October through March) as a result of the greater air-ocean temperature contrast. Since we are particularly interested in understanding the mechanisms of troposphere-stratosphere interactions, we use a large perturbation (sea ice anomaly) in our sensitivity experiments. We take late 21st century (2051-2080) sea ice variables from the Community Earth System Model Large Ensemble project; CESM-LENS. In an earlier study (Labe et al., 2018a), we show that the historical CESM-LENS sea ice thickness compares well with satellite observations and output from an ice-ocean model. Overall, we conduct five different experiments using WACCM4 to compare the atmosphere responses to loss of sea ice concentration (SIC), loss of sea ice thickness (SIT), and their combined effect (NET). We also conduct two additional experiments with loss of sea ice placed only in certain regions Subpolar sea ice loss vs. Polar sea ice loss). 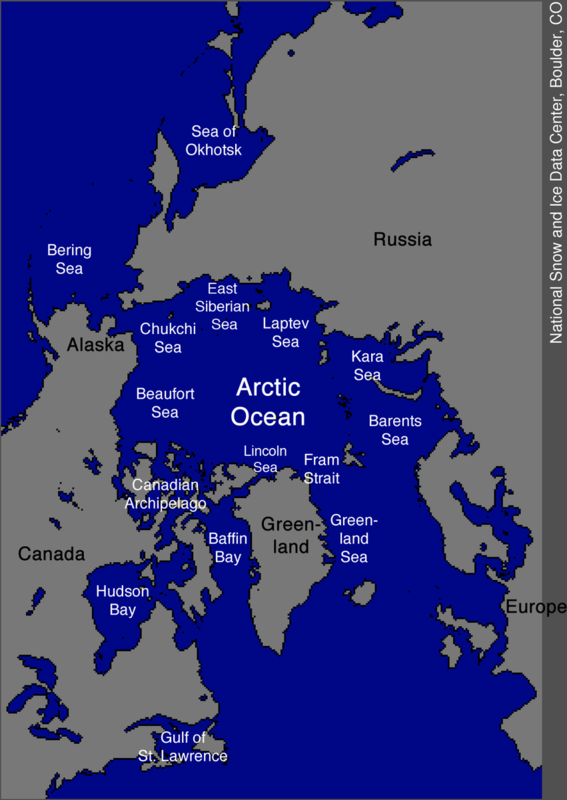 The subpolar sea ice loss is mostly in the Sea of Okhotsk and Bering Sea, while the polar sea ice loss is mostly in the Barents-Kara Seas region (Fig. 2). To isolate the contributions of sea ice concentration vs. sea ice thickness, we set all other variables to a repeating climatology taken from the historical CESM-LENS 1976-2005 mean (e.g., Fig. 1). Our results stress the importance of considering loss of sea ice thickness in future climate change assessments. Our model experiments demonstrate that the response to loss of sea ice thickness reinforces the effect of loss of sea ice concentration in the troposphere. This is particularly found in changes to the surface air temperature, sea level pressure (Fig. 3), and 500-hPa geopotential height fields. We find an equatorward shift of the polar jet stream, which is mostly as a result of loss of sea ice concentration. Loss of sea ice thickness contributes to a negative Northern Annular Mode (NAM/NAO)-like response, which is found in the net sea ice loss experiment. The role of the stratosphere is unclear in these experiments, and we generally find large internal variability (noise) in the response. However, there is some indication that loss of sea ice concentration contributes to a strengthening of the polar vortex. Perhaps somewhat more interestingly, we find a clear opposing response in the stratosphere to polar vs. subpolar sea ice loss. This has also been shown in earlier studies (e.g., Sun et al., 2015). Our analysis shows this “canceling” effect is nonlinear when compared with the net sea ice experiment. Essentially, this means that by adding the polar and subpolar experiments, we do not get the same response as the net sea ice experiment in the stratosphere. This nonlinearity will be the subject of future investigation. Fig. 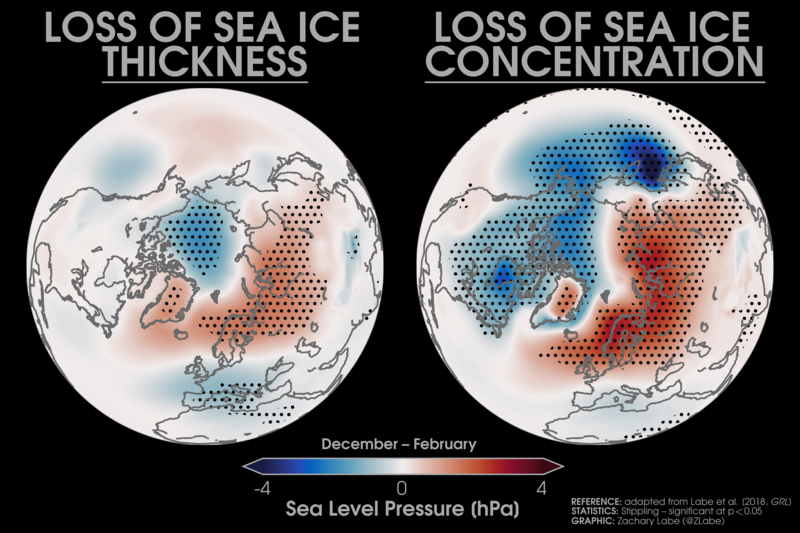 3 – Response of sea level pressure (hPa) to future loss of Arctic sea ice thickness (left) and sea ice concentration (right) during the boreal winter (December through February). Statistically significant responses at the 95% confidence level are shown by the black stippling (dots). This figure was adapted from Labe et al. [2018, GRL]. 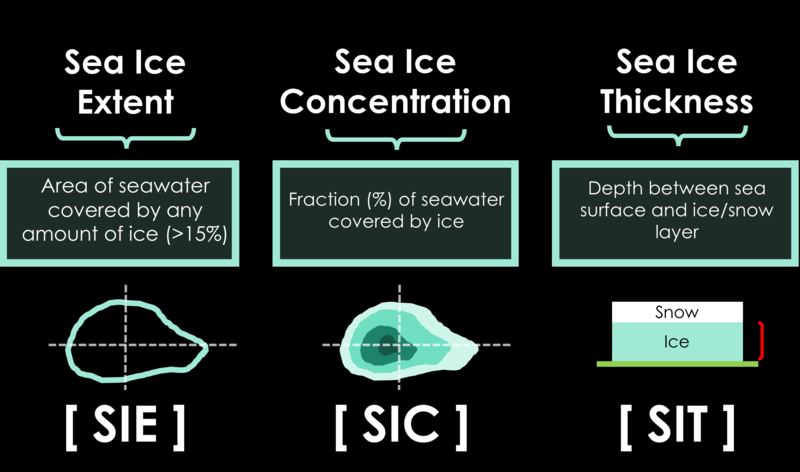 Overall, we find the loss of sea ice thickness contributes up to 1/3 of the response from loss of sea ice concentration in the lower to mid-atmosphere. Therefore, future AGCM modeling studies should account for both changing sea ice thickness and sea ice concentration. We emphasize that our study uses sensitivity experiments, which do not include other important processes found in coupled climate models (e.g., ocean dynamics). Instead, we are interested in isolating the role of sea ice thickness on the atmosphere and quantifying its contribution compared to sea ice concentration.